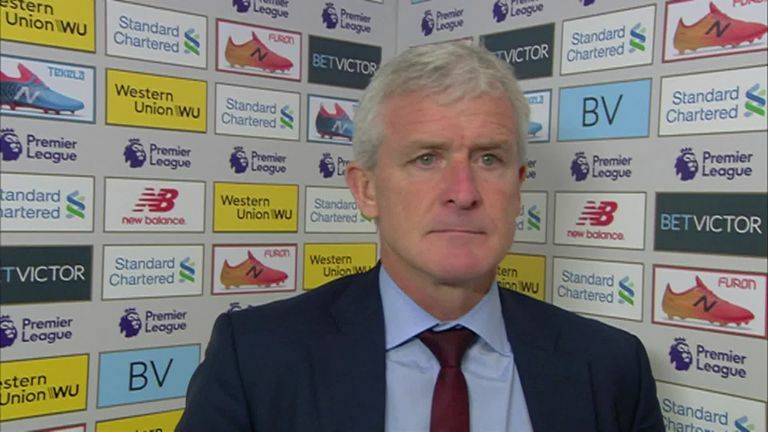 Mark Hughes says his Southampton side gave themselves a "mountain to climb" after conceding early goals against Liverpool. Jurgen Klopp's side claimed a 3-0 win at Anfield, with all three goals coming in the first half, and Hughes was frustrated by the manner in which Saints conceded the first two. The result leaves Southampton in 14th place and with just one win so far this season. "In the key moments of the game, the opening periods, you want to be nice and solid," Hughes said. "We're always giving ourselves a mountain to climb and it is difficult on the best of days to come to a place like Anfield and make sure you've still got a foothold in the game. "The third goal on the stroke of half-time really was difficult to take. I felt that in general play we caused them a few problems in terms of rotation in wider areas, we had a couple of opportunities to get balls across but we looked a little bit vulnerable whenever they attacked and broke on us." Hughes felt his side improved in the second half and did well to prevent Liverpool scoring again. "If you come here and you're going to have any chance of getting something then you need to have that foothold, that platform to be able to build a performance and ask more questions of a very good Liverpool team," he added. "It has to be said, they're on top of their form, they've got some outstanding individuals and it was always going to be difficult for us. But in the first half we conceded too many easy goals. The second half was better but you could argue that they were quite happy with the situation at 3-0 to the good."